I Went to An Elite Prep School Like Covington Catholic. Here’s What I Saw. Before I get into this, I must state that I had an unequivocally positive experience in my seven years at a prep middle/high school in Colorado. One of the main reasons that you are reading this right now is thanks to the education I received at this elite school in one of Denver’s richest suburbs. I am not here to badmouth my high school, but to provide a window into an elite institution with a graduating class of around 120 that cost a little more for me to attend in the early 2000s than the $10,000 that it costs to attend Covington Catholic today. Covington Catholic is the high school at the center of the latest cultural firestorm. There is a lot of noise filtering through our hapless both-sides mainstream media environment that prioritizes selling you trust over truth, and there is no reason to disbelieve your eyes. The videos speak for themselves. A group of MAGA hat-clad teenage boys were being taunted by a literal handful of Black Israelites—the very small extremist group most famous for yelling obscenities at D.C. tourists—and when a Native American attempted to intervene to calm the situation (per Nathan Phillips’ own words, backed up by longer video showing him approaching the MAGA teens), the teenagers taunted him with cartoonish racist chants like the Tomahawk Chop (yes Kansas City Chiefs and Atlanta Braves fans, it’s racist when you do it too). I wish I could say that I was shocked by this, but I’m not. My high school experience wasn’t anything remotely like this, but the mob mentality of high school boys in this video should be recognizable to anyone who grew up in any socioeconomic bracket. The problem is that when you combine the standard barbarity of teenage boys with cloistered privilege, that’s when situations can really spiral out of control. 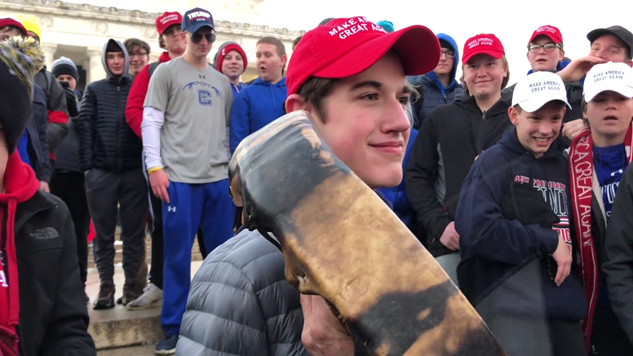 If a responsible adult is around to check this cloistered privilege, things can de-escalate pretty quickly, but if the adults abdicate their responsibility to be, well, adults, things can get pretty ugly—as seen in the adult-less Covington Catholic video above. It speaks volumes that we are on day five of this national firestorm right now, and the children are still being put front and center in this PR nightmare for the school. Where the hell are the adults at Covington Catholic? When I speak of my positive high school experience, I am largely speaking about the adults who helped shape me into the person I am today. Adults like my freshman year English teacher—the greatest thing to ever happen to my writing ability. My family impressed the importance of being a good writer upon me, but it wasn’t until her English class that I fully realized my love for what became my livelihood. I recovered from my first heartbreak with the help of a teacher who showed me that it was okay to show your emotions and still be a man. My adversarial, yet ultimately friendly, relationship with a science teacher who knew I had no future in the subject remains one of my warmest memories to this day. I had a baseball coach/Spanish teacher who helped me through some trying times both inside and outside the classroom. There are a lot of super talented adults at these elite institutions, and it is in part related to the crisis of our public schools, as the barbarically low pay and underfunding chases away teaching talent to institutions willing to pay a premium to shape the next generation of minds. There were also some not-so-great adults in the orbit of my high school, and some of the most notorious grievances from high school occurred under/away from their watch. I can’t think of a single teacher who would fit this description, but I have already lost count of the number of parents/assistant coaches in my prep school’s extended universe who do. We were not a religious school like Covington Catholic, but damn near every team in our sports divisions were. Most games on my baseball schedule came against some school with either “Faith” “Holy” or “Christian” in its name, and I can remember a couple instances that show you how hit or miss these schools can be. One school was notorious for playing a really hard-nosed, but clean brand of basketball, all while profusely apologizing every time they knocked someone down. It was hilariously endearing. Their coach would immediately call timeouts to bench showboating players for the rest of the game. Everyone loved playing against them. Another school does not give me similarly fond memories. After one baseball game, their players asked if we wanted to come pray with them, and me and my teammate thanked them but declined because we are Jewish. One of the assistant coaches—an adult—then said “well enjoy damnation, then.” The next time we played them, a few players were making devil horns every time either of us came up to bat—a famous anti-semitic trope comparing Jews to the devil—and no adult stopped them until my 3rd time up to bat. The truth of the matter is that among these elite institutions, there is a significant number of adults with far more money than sense. Oftentimes they are major donors to the school, as some of these small, petty individuals can only conceive of exercising their power through money. I don’t know anything about Covington Catholic’s internal dynamics, but in the context of my personal experience at a prep school, it’s not shocking in the least bit that the chaperones who did nothing to ameliorate the situation at the National Mall this past weekend were parents, not teachers. I wouldn’t assign the same figures to who can be counted on and who cannot, but this is roughly the overall structure of the adult dynamic I experienced. Keep in mind that these are kids that we’re talking about at Covington Catholic. While the smug MAGA kid no-doubt elicits a kind of primal rage specific to America, that face we’re looking into isn’t completely his. Teenage boys are the most insecure beings known to mankind, and the vast majority of what they do is to parrot what they believe to be cool. If I had the choice of detailing what I thought was cool throughout the entirety of my adolescence, or sharing my browser history with the general public, I wouldn’t hesitate to choose the latter. We can only condemn these kids to a certain degree. I put the adults first in this piece because it’s their job to make sure that they don’t create little monsters that grow up to become hulking monsters. There is little that we know about the kids’ culture at these schools outside of general stereotypes from pop movies, and I can testify that those stereotypes do contain some universal truths, as life at a prep school is different from life at a public school. My sister and one of my closest childhood friends both went to public high schools, and while there is plenty that we all share in our high school experiences, there are simply some stories that can only happen at a school where my four-year old Subaru was easily one of the five to ten worst cars in the student parking lot. I obtained a unique view into this world, as I could be described as “just browsing” the elite. My father was a stockbroker, and so it is not a coincidence that I went to a private high school pre-2008, while my sister attended a public one post-2008. I simply wasn’t born with the elite family connections that would get me in with the popular kids in school. The Venn Diagram of the cool kids and the richest kids in school was damn near a circle thanks to their ability to do fun things together without worrying about the cost, so if you’re looking for juicy uber-rich kid gossip, sorry, this ain’t it (and besides, even if I had any, I’m not going to use my platform here to rat on a bunch of kids from 2004). I attended a handful of big parties, and they were mostly what you’d expect out of a prep school. While my sister’s public high school parties were littered with beer like Keystone Light, ours had imported bottles scattered everywhere. One time a bunch of kids from another school stole a bunch of artwork that wound up being worth over six figures. The parents were not home at the time, came home, “grounded” the kid, then immediately left to jetset across the world again—and we were back partying at this kid’s place a few weeks later. The commonality among all the party houses was the absence of parents, and there were a handful of specific houses that became part of the circuit. I saw cocaine before I saw marijuana. It wasn’t even at a party—but in the bathroom at a state championship game we were playing in. The kid who offered some to me swiped it from his dad. We even knew kids on state championship winning teams at both our school and other prep schools who were high on coke during the state championship. It wasn’t a school-wide problem, but in the very small circles where cocaine was found, it very much was, and there were overlapping social circles between schools that had this issue. Again, the commonality in my hazy memory of all these kids was a lack of parental supervision. The kind of outright dickishness that we witnessed in the facial expression of the MAGA kid blocking Nathan Phillips’ path is also something that prep school veterans should be very familiar with. Go anywhere in Colorado and ask high schoolers about my school and they will respond with near-universal condemnation. We are the bad guys in the high school movie, and that face may as well be its own kind of MAGA hat for the rich, white, dudebro culture that dominates these elite institutions. Covington Catholic said that they were just being rowdy and doing school chants, and I can attest from my experience that some of the behavior I most regret came while trying to express my school spirit at sporting events. While the head coaches of our sports teams who doubled as teachers were pretty good at nipping our outright douchebaggery in the bud, the lower-level assistants who were less directly affiliated with the schools in our socioeconomic bubble were sometimes prone to encouraging it. I can remember one instance where we chanted “bag our groceries” (that I stupidly participated in) at a public school we were playing, and how an assistant coach was reprimanded for his sideline support of it. We were complete jackasses at sporting events, and we reveled in the hatred we received. We shoved our privilege in people’s faces at these games, and I can confidently say that the best thing that ever happened to me was going from this elite private institution to a public university at UMass—where I befriended a litany of folks who grew up in a very different socioeconomic environment than I did. It’s not that the culture of my high school was rotten—it’s that privilege, adolescent insecurity and testosterone combined with a lack of adult supervision can create some really ugly scenes. There were times where the “bag our groceries” chant broke out, and we were immediately chastised and that was the last you heard of it. Again, we were kids. Our brains literally are not developed enough to truly understand what we were doing—that’s why we need real adults—and I am eternally thankful that was lucky enough to attend one of the elite prep institutions where responsible adults populated the school. Teenage boys are idiots. All of them. If you are a teenage boy reading this, I’m sorry to break the news to you like this. One day you will hopefully not be an idiot, but right now, you are. Your friends are too. It’s okay, though. You’ll go to college or get a job in the real world—meet lots of brand new people that will hopefully shape your worldview away from being an idiot—and eventually realize that your entire adolescence was one big bait-and-switch, and the real world is nothing like you were taught and that many of the so-called adults you thought had a handle on things actually had no freaking idea what they were doing. Given that two-term President Trump is a real possibility thanks solely to the over-40 crowd, the cartoonish depiction of panic-stricken and easily manipulated adults on South Park is far closer to reality than you’ll see on most other TV shows. The central problem with elite institutions isn’t the kids, it’s some of the adults. Ultimately, this Covington Catholic saga is a story about power. Prep schools do not have a monopoly on racism or toxic masculinity, but they do have disproportionate power to spread those universal evils. Disproportionate power to force kids to ride a bus to a non-political march becoming increasingly politicized thanks to the elite orbit controlling schools like Covington Catholic. Disproportionate power to imbue future beneficiaries of disproportionate power with their biases. Disproportionate power to financially influence the conversation surrounding their disproportionate power. That’s how we arrive at a moment where the MAGA kid at the center of this gets a puff piece interview with NBC to rehabilitate his image, yet the Native American does not because his daddy does not have a PR firm on call run by a CNN contributor who is a close confidant of the Republican Senate Majority Leader. Power in America is a finite resource, and our hypocritical founding document which states that all men are created equal, yet slavery is legal, has concentrated that power in white hands. I can count the number of non-white kids in my graduating class on two hands (we were far from the only private institutions that exhibited this dynamic), and these elite institutions are seemingly built to reproduce the white ruling class. Meritocracy is largely a myth in this country, and my experience at a prep school and a public university is proof. I can promise you that the smartest kids that I encountered on financial aid at UMass were just as brilliant as the kid from my class who won an award from the president for his genius. We like to tell ourselves that all we have to do is “pull ourselves up by our bootstraps” to succeed in America, but President Donald J. Trump is all the proof we need that power is not remotely spread evenly among those who deserve it.